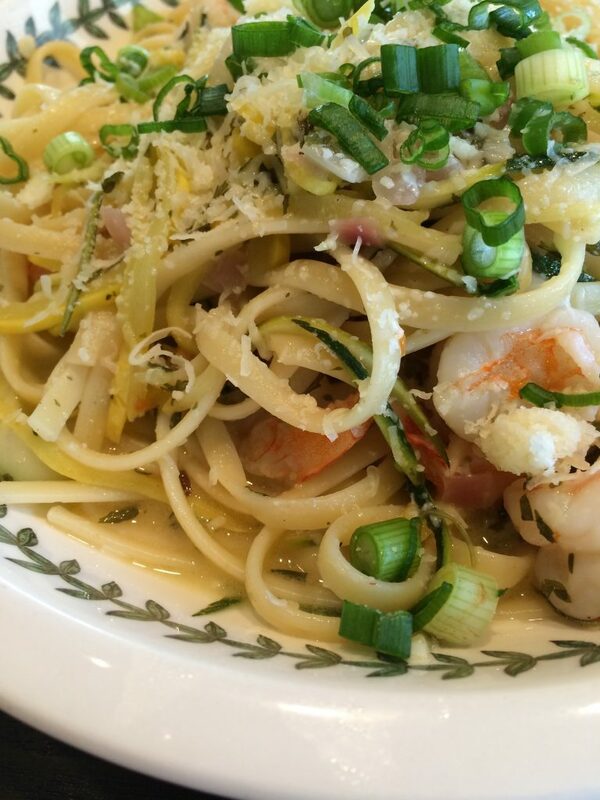 If you love shrimp & squash scampi and want to make this from home, then you have to know these three crucial factors. First is that timing the sequence is most importance, second is that the wine you use makes a difference, and third is how you cook the shrimp matters. I created this recipe from the inspiration I got eating out at a pizza kitchen. Ella actually ordered it to share with the kids. The kids love to eat noodles, so she thought it would be a way to get them to eat some vegetables too. The restaurants preparation of the dish was different than the recipe that follows. The recipe that follows builds on what was prepared at the restaurant, and adapted for better presentation. I hope you enjoy my version of this delicious meal. I know that we love this recipe and I am certain you will too. Shrimp & Squash Scampi’s most crucial factor is that practice the timing of the sequence of the simultaneous actions needed to cook this dish. In the end you want everything to come together at the same time. 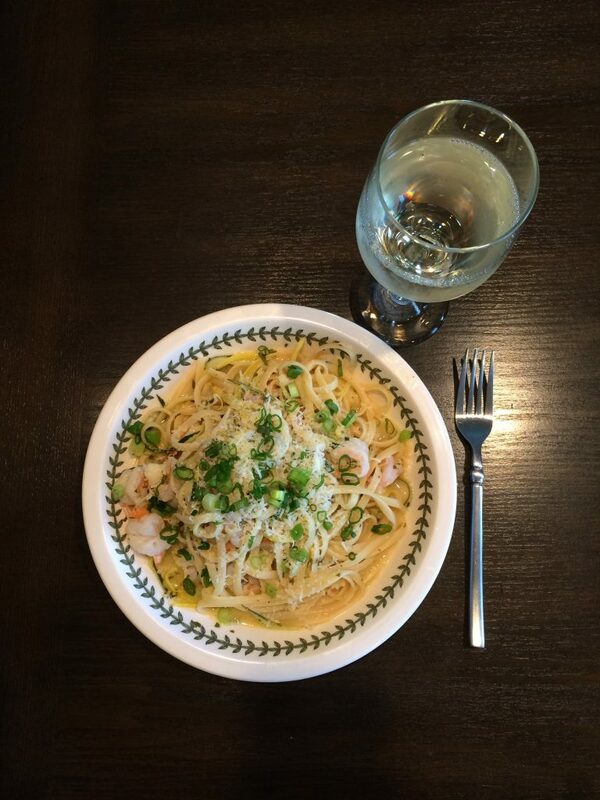 The shrimp scampi needs to be done at the same time as the pasta is done, so that it is not cold as you put it into the linguini. Also so the linguini is not waiting the scampi to finish and get stuck to itself. The end of this recipe needs to all come together in a 1,2,3 fashion. Drain the pasta, return the pasta to the pot, and stir in the scampi. 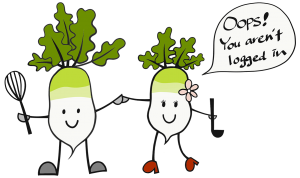 There’s two more crucial factors that goes with making this recipe that we want to share with you. We reserve our best tips, tricks, and secrets for registered members or people who will share our content. Please either login or create a free account by registering or simply use a social media account to shrare. Gather the ingredients. Then read the tricks found here. 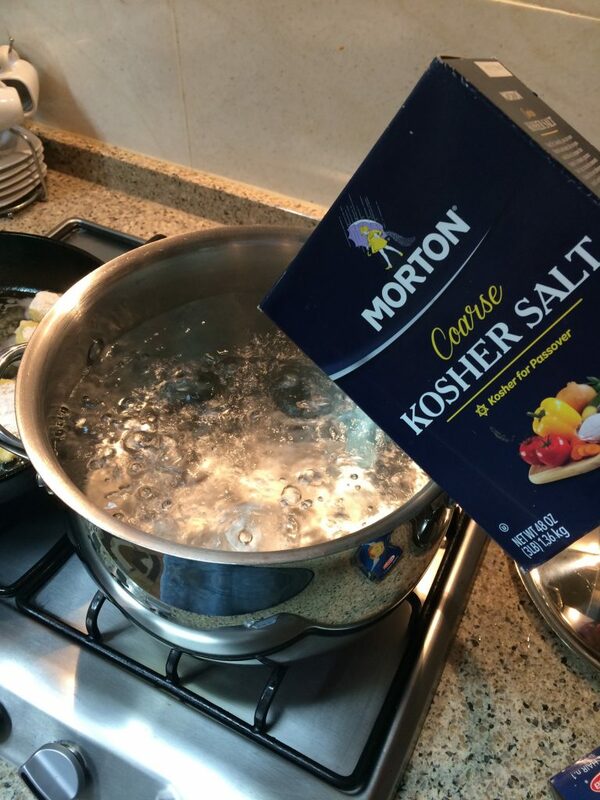 Bring 5 to 6 quarts of water to boil, add 1 tbsp of kosher salt. 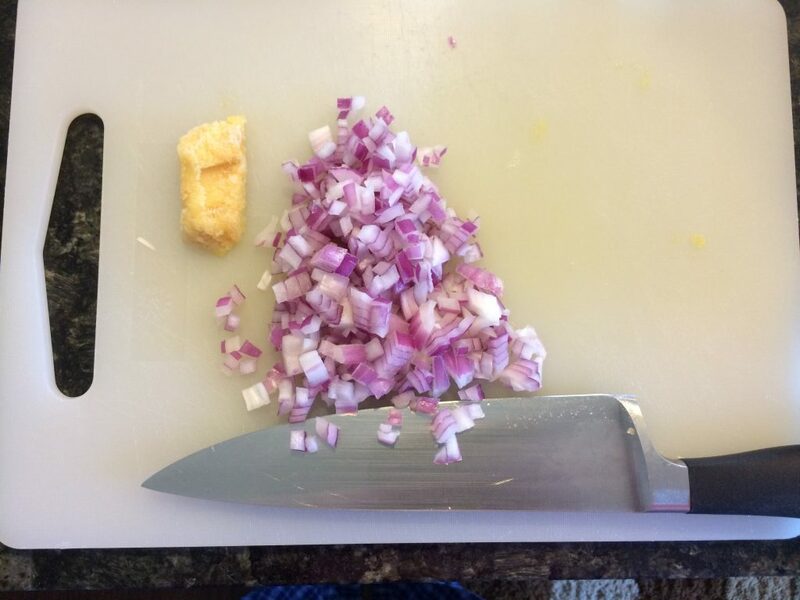 Add pasta when you begin to cook the onion. 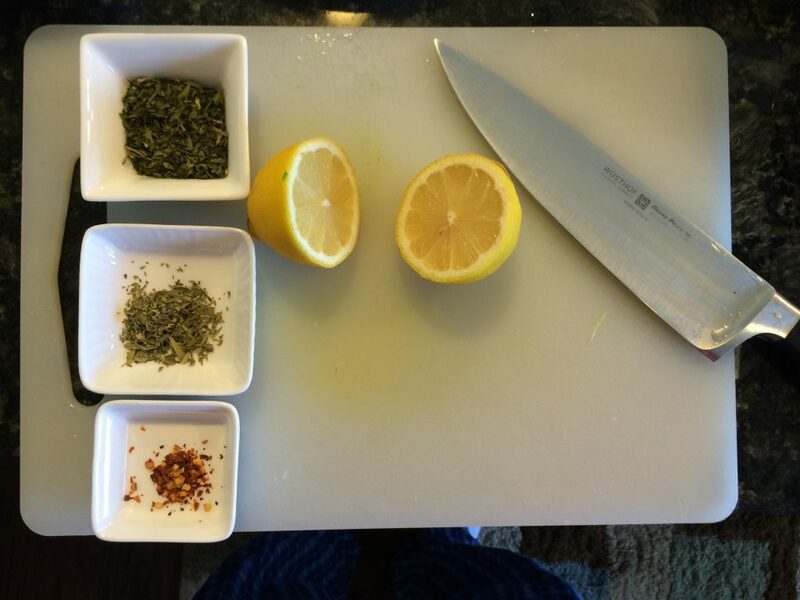 Gather the spices and the lemon. Measure the ingredients and set aside. 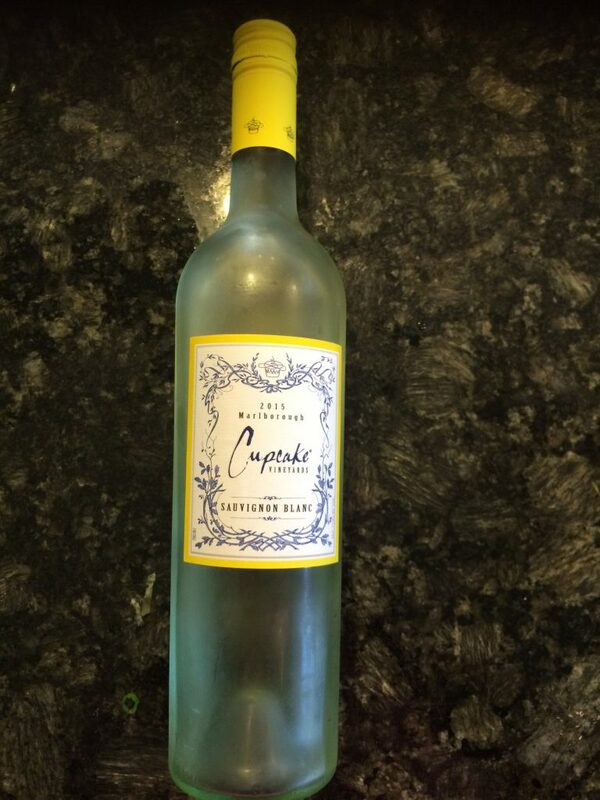 Measure out one cup of wine and set a side. Dice the onion and prepare 1 tbsp of garlic. Hack: We use a lot of garlic, so we buy a large quantity of peeled garlic and mince it in a blender, and freeze it in sandwich bags. When we need it we simply cut off the amount we intend to use. 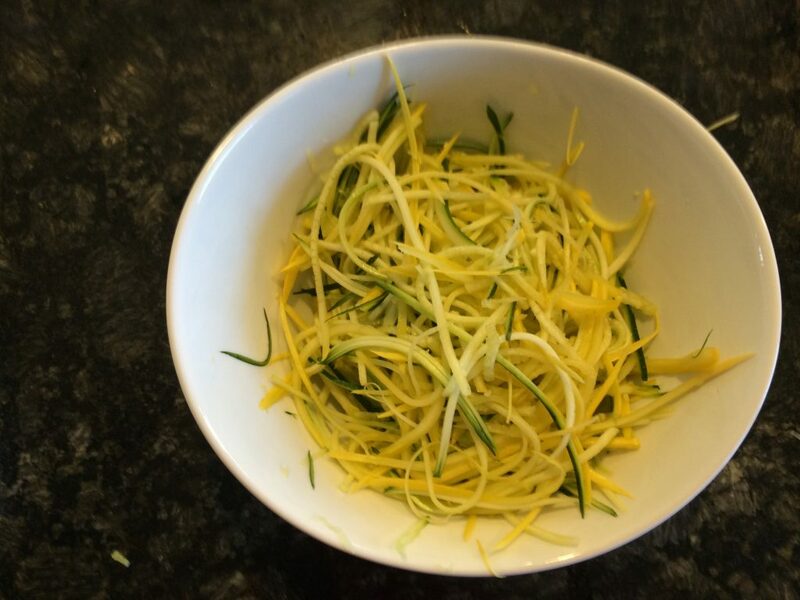 Wash the zucchini and yellow squash, cut off the top and bottom of the zucchini. 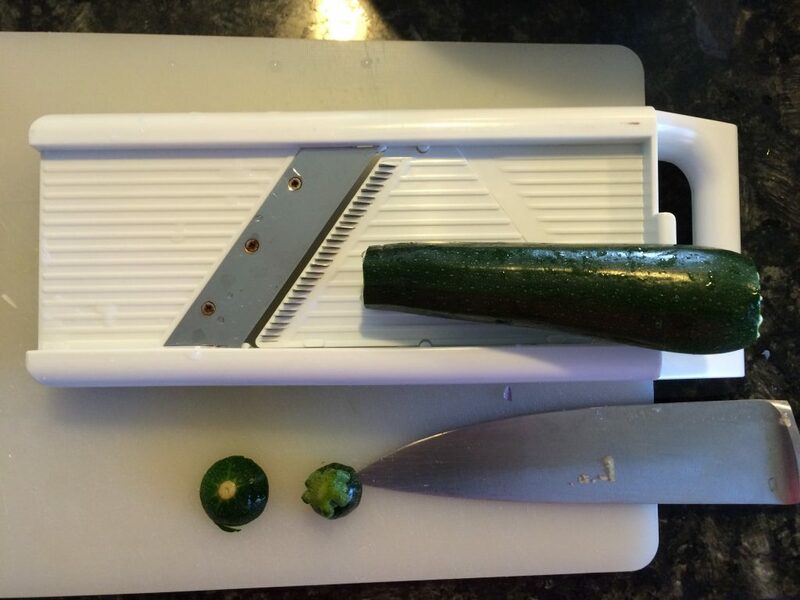 Slice the zucchini with a mandolin. 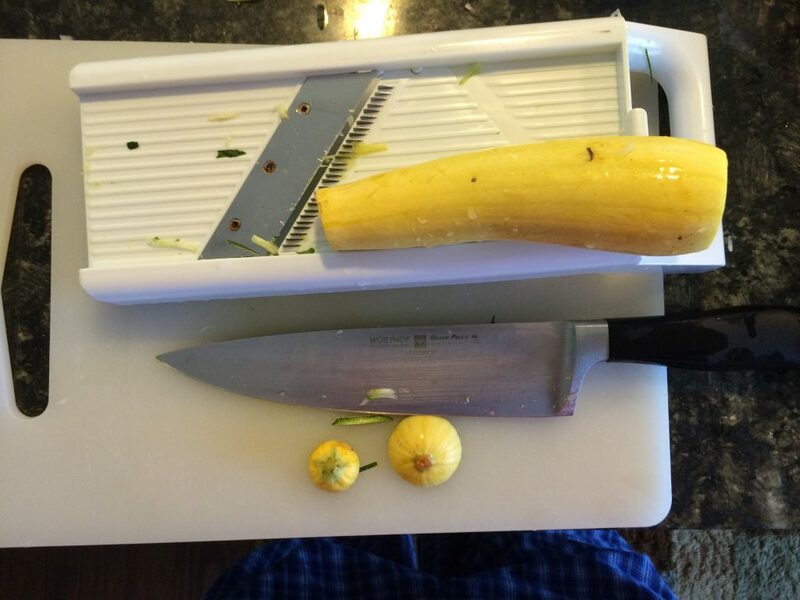 Slice the yellow squash with a mandolin. 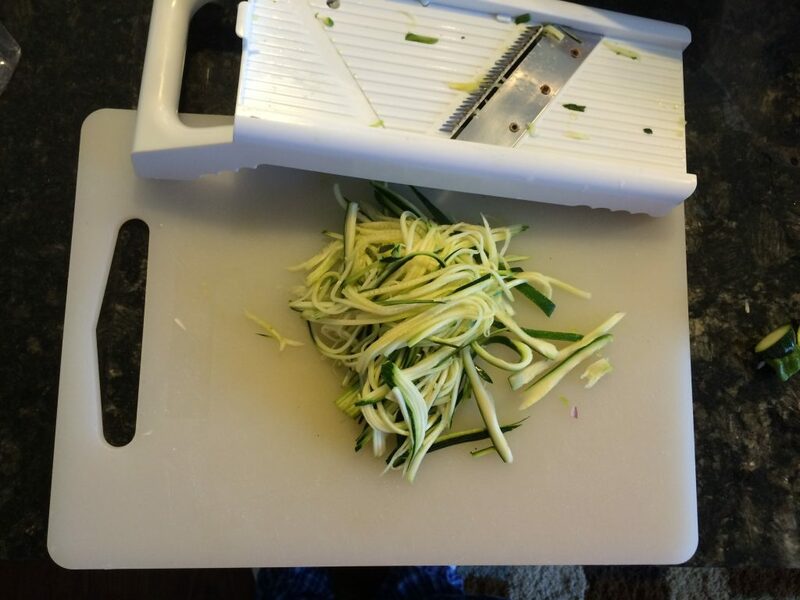 Set the zucchini and squash a side until needed for cooking. Heat 1 tbsp of olive oil in a skillet on medium heat. Add pasta to the boiling water. 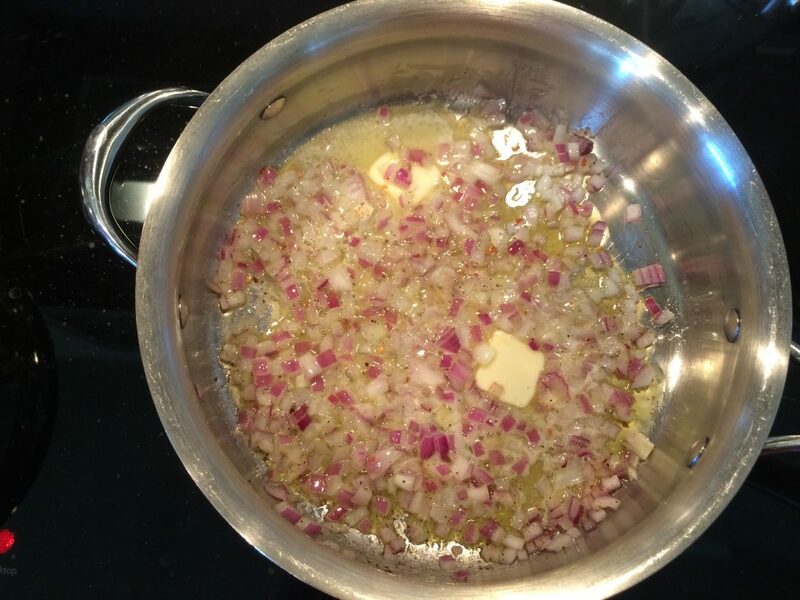 Add onion and one tablespoons of butter and cook on medium heat for 3 minutes. Add salt, pepper, red pepper. Then add the garlic and cook one additional minute. Next add the shrimp. Cook only long enough for the shrimp to ever so slightly turn pink, about 1 minute. Immediately remove the skillet from heat and transfer the ingredients to a bowl. The shrimp will continue to cook gently in the warm butter and onions. Next heat the wine to a simmer for 3 to 5 minutes, reducing and concentrating the wine flavor. Reduce heat to low, add parsley and tarragon to the wine, then add 1 tbsp of butter, whisk into the wine. 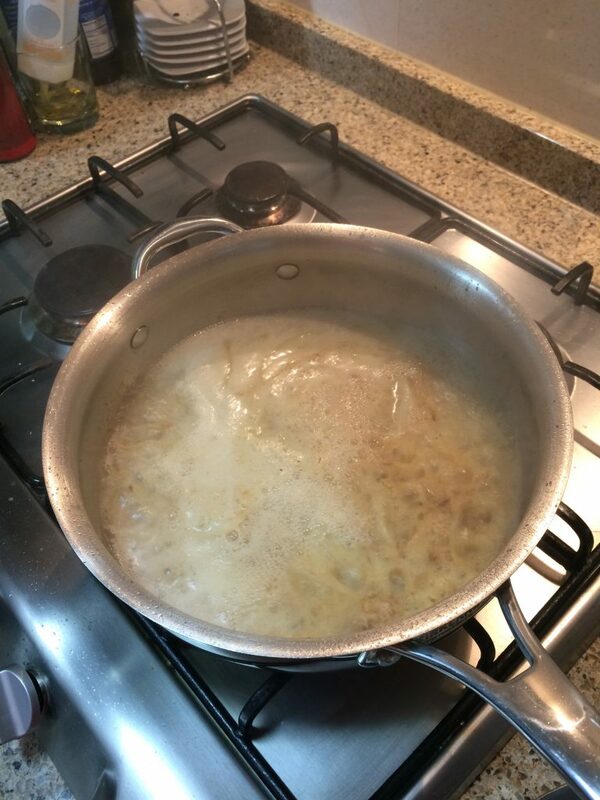 After the first tbsp of butter is whisked together with the wine add the second tab of butter to the sauce and whisk it in. Finally, add the remaining tbsp of olive oil into the wine sauce. Add the squash to the wine sauce, put the shrimp and onions back into the sauce pan. Gently simmer everything until the squash and shrimp are done, about a minute. You want to increase or decrease the temperature to match the time that the pasta is done cooking. When the pasta finishes cooking. 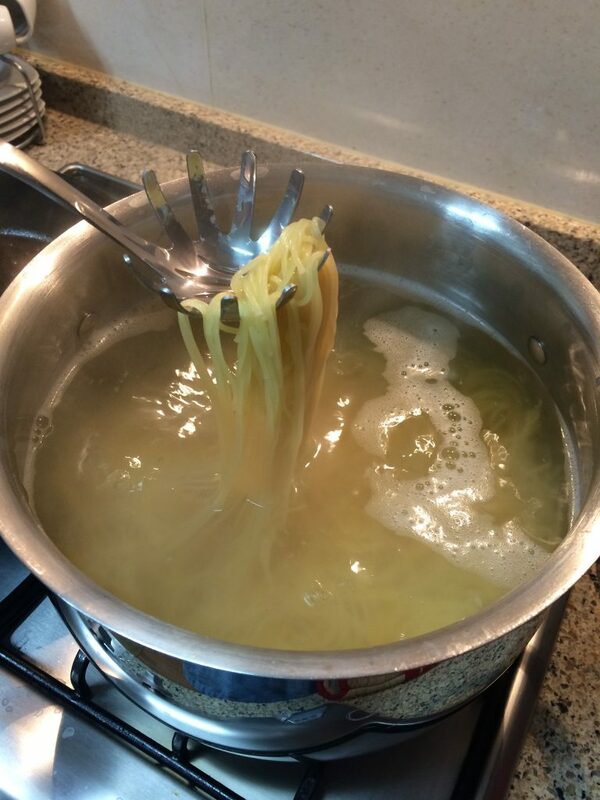 Drain the pasta, but do not rinse the pasta, and return the pasta back to the stock pot. While the pasta is hot pour the shrimp scampi mixture into the pasta. Stir all the ingredients together, and cook until shrimp is done and squash is tender. Shrimp is done once it turns pink. This won't take long, so watch the shrimp, and stop cooking immediately after the shrimp turn pink. For the best result, don't over cook the shrimp, its done at a light pink color. Be sure to prep all the ingredients ahead of time and before beginning to cook. Once you begin cooking this recipe it cooks very quick and you won't have time to be cutting and measuring ingredients. 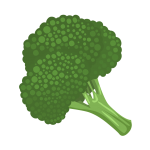 I like to begin with measuring all the ingredients and cutting all the vegetables. Once I measure and cut everything, I set those close to where I will be cooking. That way I won't forget a ingredient, and I won't have a hassle trying to find something at the last minute. Be sure to use a skillet that is large enough to hold all the ingredients, I use a stainless steel skillet for this recipe. I avoid using nonstick pans for recipes that don't need them. It saves on their wear. 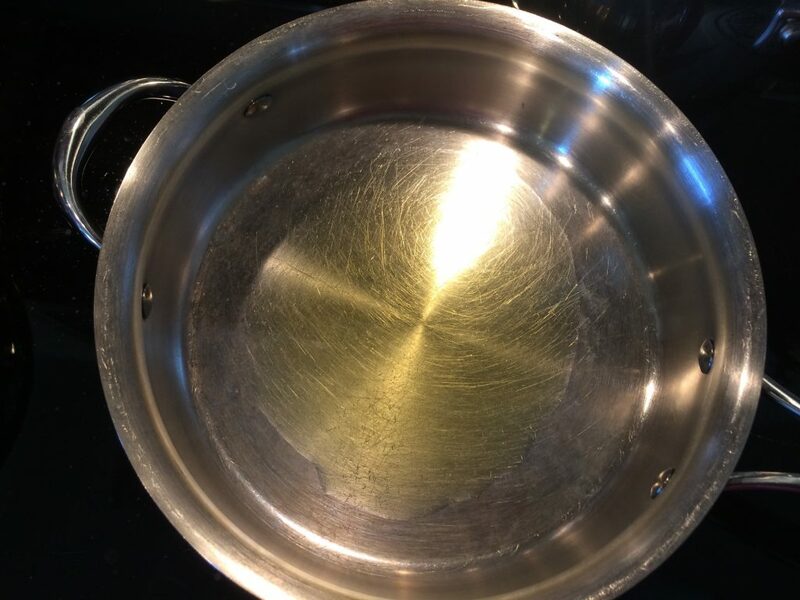 Aside from that cooking food on high heat can damage nonstick pans.